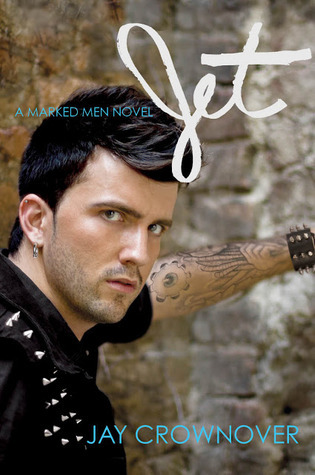 Jet is book #2 in Jay Crownover's Marked Man series (book #1 is the awesome Rule)! What they say: With his tight leather pants and a sharp edge that makes him dangerous, Jet Keller is every girl’s rock and roll fantasy. But Ayden Cross is done walking on the wild side with bad boys. She doesn’t want to give in to the heat she sees in Jet’s dark, haunted eyes. She’s afraid of getting burned from the sparks of their spontaneous combustion, even as his touch sets her on fire. What I say: I loved Rule the first book in Jay Crownover's Marked Man series about tattooed badboys and the girls who tame them, and so I couldn't wait to read Jet. Crownover has again used the dual POV formula which worked so well in Rule, but this time the story is told by Ayden Cross (Shaw's bestie from book #1) and Jet Keller (Rule and the other tattoo artists singer friend). I can completely understand why both Jet and Ayden behave they way they do and it's easy to see what motivated them. I loved Adyen's friendship with Cora, and their ranking system for Jet's one night stands had me in stiches! It was great to see how Rule and Shaw's relationship had progressed and to catch up with the other characters from book #1. There's a decent amount of drama and tension, although I did think some of Jet and Ayden's character traits were borrowed from Rule and Shaw. I also remembered Ayden being a lot more forward than she was at the beginning of Jet. As the plot developed we got to read Ayden's thoughts and motivations it became clear that who she was and who she thought she should be were completely different, but therein lies the fun! A good follow up, although I still slightly preferred Rule but I'm looking forward to Rome's story coming up next. No boy should be that good-looking, especially when half his face had holes and jewellery in it. "This Ayden is the one who has to decide why she is settling for mil and cookies when what she wants is edible body paint and furry handcuffs." "I think you're just pissed Miley Cyrus copied your haircut and you're taking it out on innocent girls across the land." "By the way, she was totally a ten when I saw her this morning, so way to go killer."